The reliable workgroup colour laser with outstanding print quality and performance. To see fine details in your photos and business graphics, the Lexmark C760 has true 1200 x 1200 dpi. 4800 Color Quality (the default) produces high print quality. 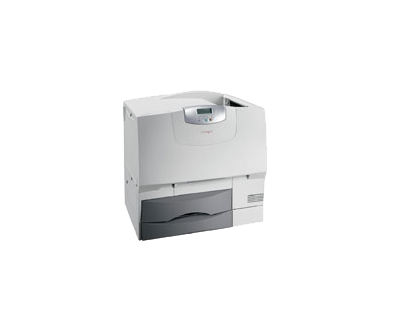 The Lexmark C760dn with a print speed of up to 25 pages per minute Letter (23 pages per minute A4) for both color and monochrome, and a 600 Mhz processor generates the first color page in less than 15 seconds and 13 seconds for black. Users get their jobs in a hurry reducing or eliminating the wait at the printer. Color Care Technology lets you make intelligent choices for use of color in your business documents. With ColorSaver, you can save 50% on the color toner by making color images and graphics lighter while keeping black text dark, crisp and readable. For a specific workgroup, the Black and White Lock, a Setup Menu setting, prevents the use of color toner by forcing all jobs to be printed using black toner only. Color Print Permissions allows an administrator to assign permission to a color printer by user ID. For a specific user, a driver for the C760 supporting Black Only printing restricts the use of color toner. Use color when you want or when you need and control the cost of your business documents. The Lexmark Coverage Estimator provides toner coverage percentages for each color on a printed page to help you understand the estimated cost of printing in color. It's probably lower than you think.